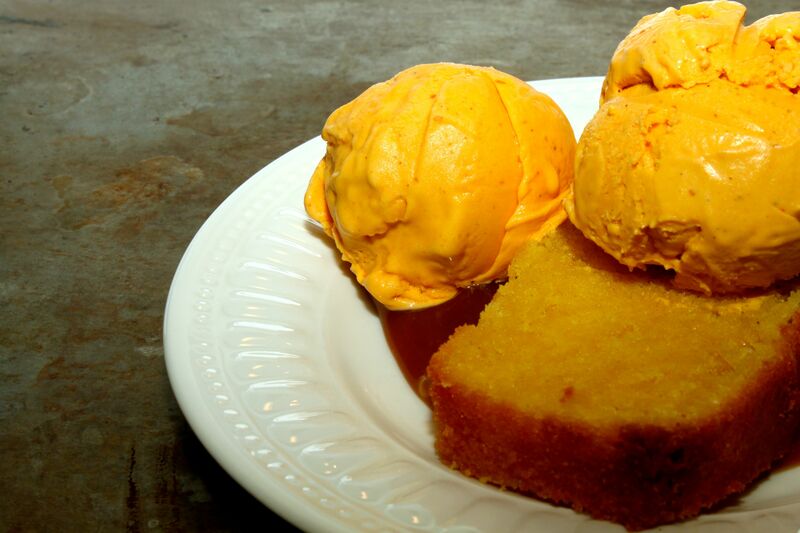 A few weeks ago, I wrote about the deliciously spiced pumpkin pie ice cream from Sargent Sundae. I vowed to return before the season wrapped up – it took three days for me to stop by and pick up two 1-litre containers of the seasonal treat! Hmmm… now, how can I showcase the ice cream without letting it completely steal the show? 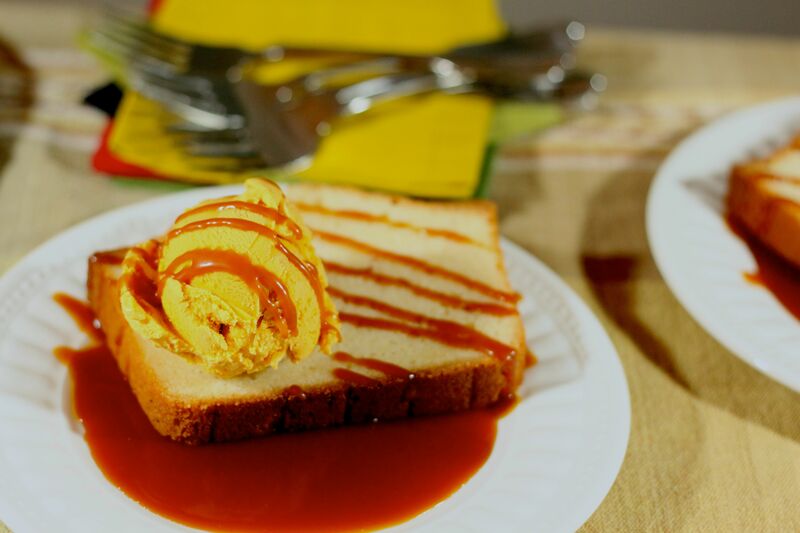 I know – pair it with a slice of classic pound cake along with homemade maple whisky caramel! A perfect fusion of autumn and Canadian flavours. On our most recent trip to Ontario, I visited the LCBO and picked up a bottle of Sortilège. I was introduced to the Québécois product a few years ago by my father who was pleased to share his newfound and quintessential Canadian spirit. It is a unique blend of Canadian whisky and pure maple syrup. The intense maple quality is perfectly balanced with Canadian whisky to create a characteristic experience. You are faced with a pronounced maple aroma as you begin to sip the liqueur followed by a consuming maple syrup flavour which lingers long on the palate. Sortilège is a one of a kind product that holds a special place in our liquor cabinet – only to be displaced by the Prestige version of the apéritif, when we can get our hands on it! Over low heat, cook sugar in a dry heavy saucepan, swirling the pan until sugar is melted and pale golden. 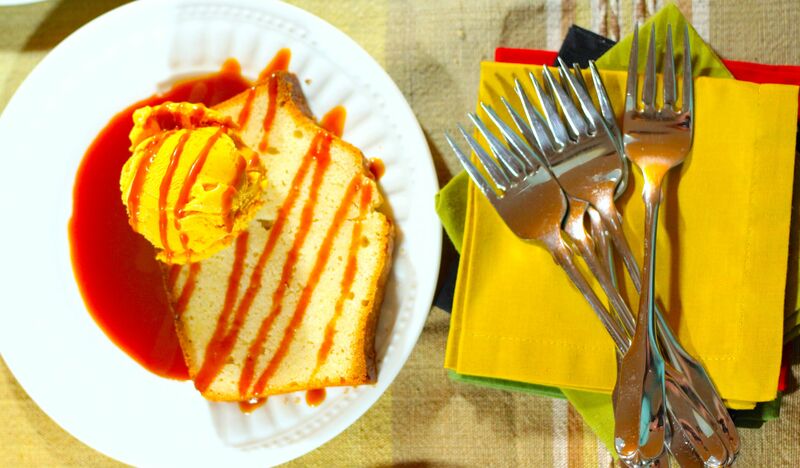 Cook caramel without stirring, swirling pan, until deep golden brown about 10 minutes. Remove pan from heat. Carefully pour cream into sugar (mixture will bubble and steam vigorously), stirring constantly. Return to heat and simmer, stirring, until hardened caramel is completely dissolved. Add butter and cook, stirring, until just incorporated. Once again, remove from heat and stir in Sortilège. Serve warm or let cool and and refrigerate until ready to use. 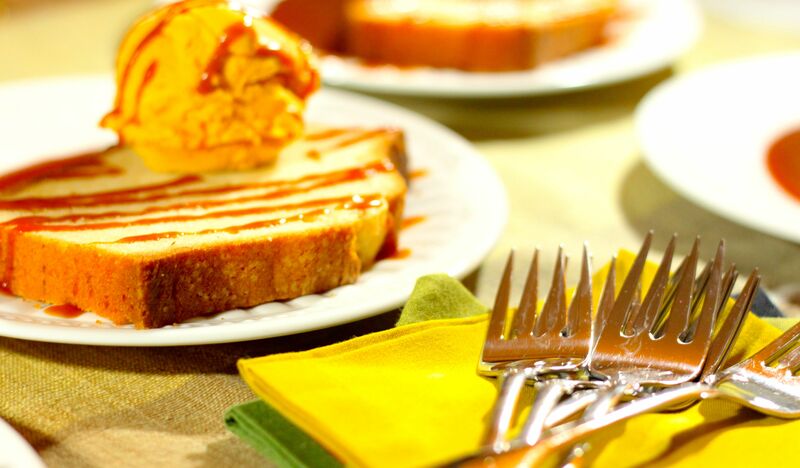 When ready to use, bring caramel to room temperature or rewarm gently and drizzle on anything and everything. With the Sortilège caramel made, it was a matter of finding the perfect foil to carry the maple caramel and pumpkin pie ice cream. After a very short search, I decided on the Classic Pound Cake from Martha Stewart’s Baking Handbook. It’s buttery goodness, with a solid but moist crumb, paired perfectly to create an elegant and decadent dessert. Preheat oven to 350 degrees. Butter a 9-by-5-inch loaf pan; set aside. In a medium bowl, whisk together flour and salt; set aside. In the bowl of an electric mixer fitted with the paddle attachment, beat the butter, granulated sugar, and vanilla on medium-low speed until light and fluffy, 3 to 5 minutes, scraping down the sides as needed. Add eggs, one at a time, beating until combined. With mixer on low speed, add flour mixture; beat until just combined. Spoon batter into prepared pan, and smooth with an offset spatula. Bake until cake is golden and cake tester inserted in the center comes out clean, 50 to 55 minutes. Transfer to a wire rack to cool, 10 to 15 minutes. Turn out cake onto the rack to cool completely. Cake can be kept at room temperature, wrapped well in plastic, for up to 3 days. Yum yum. Too bad you live so far….all you friends of Claude’s…..ENJOY! !